We had a very rare treat this last weekend so I couldn’t help but post about it! My parents organized a camp out at their house for our oldest three. They picked them up Friday late afternoon and then we went out to their house Saturday early afternoon for lunch and to pick up the kids. Since we were going to have an afternoon, night and morning to ourselves, we decided to make it a real treat! In Brian’s past life he worked at a 4 star boutique hotel in DC called the Hotel Monico. He still keeps up with some of the friends he made while working there. So… one of his friends is the hotel manager at Hotel Madera in Dupont Circle and one of his other friends is the head chef at the restaurant Firefly. Both of them have said we had standing offers for discounts on a night and dinner… so we took them up on it! The room was absolutely amazing! And dinner… wow! It’s been a long time since I had eaten like that! 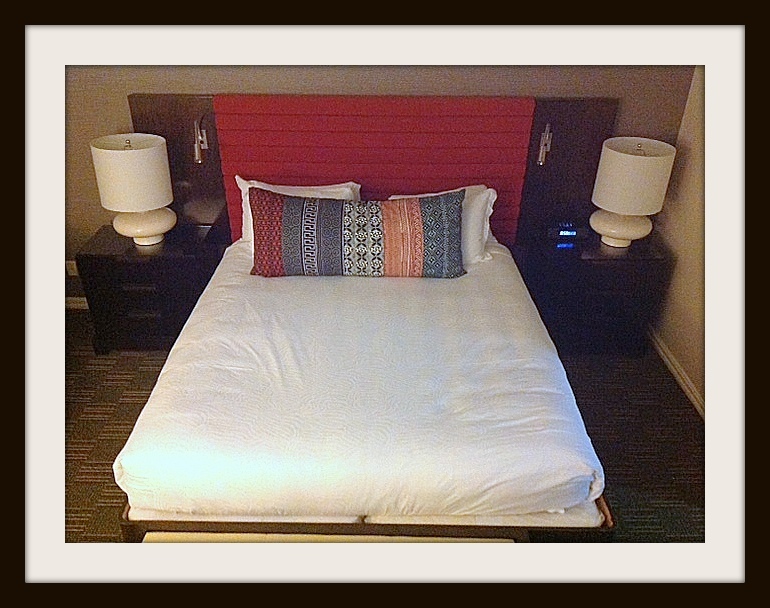 😉 The room was LARGE and plush and comfy! 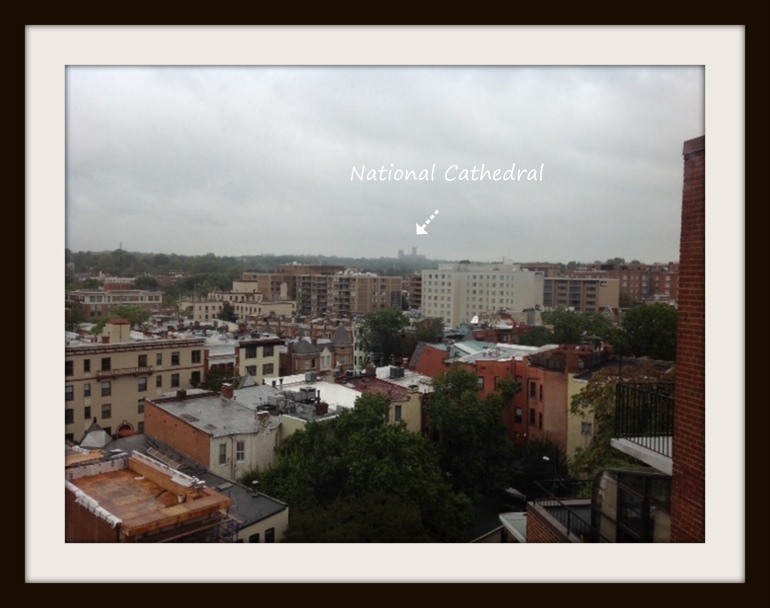 We had a king sized bed that we got lost in and a great view of the Dupont/Georgetown area (with the National Cathedral in the far distance) from our 9th floor room! When we got there we dropped our stuff in the room and then went down for dinner. 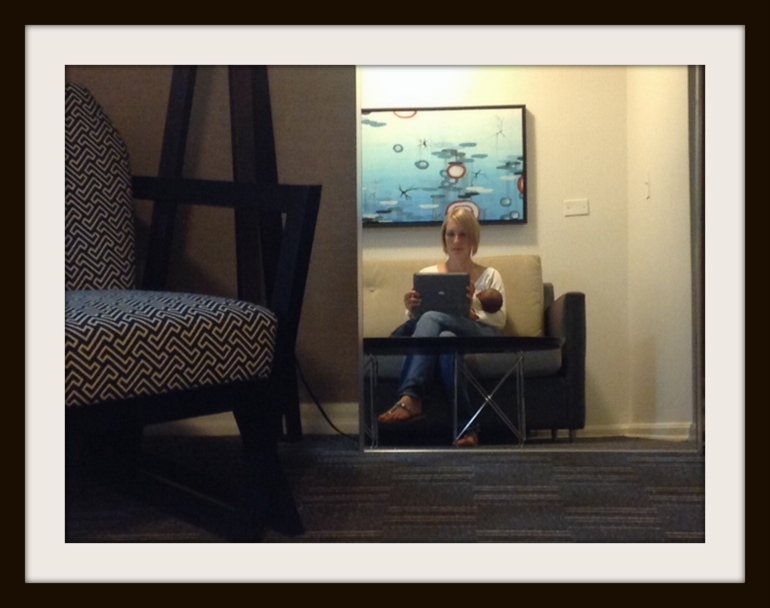 The staff was so kind and attentive to our every need! And to make it even better, Xanthie fell asleep in my lap as soon as we sat down and stayed asleep the whole meal! We tried to take some photos of the meal, but they don’t do it justice. We don’t have any kind of fancy camera, and all we had with us was Brian’s ipad with no flash. The lights were turned down low which added to the ambiance, but didn’t help for the photo taking! I tried to lighten them as much as I could… but I don’t have Photoshop either… so I just did the best I could. Hope you get at least a small idea of how special our night was! We started off with a glass of wine and the chef had specialty drinks made and brought to us and served the first course of salads. Now these salads were no ordinary salads! My salad was called the farmer’s salad (which they grow a lot of their veggies and herbs on the roof of the hotel and also use local sources for their fresh produce when available.) which had seckle pear, pecans, roasted cauliflower with a cranberry vinaigrette. Just typing out the ingredients doesn’t do it justice! There were also fried sweet potato curls on top which I’d compare the consistency to chowmein noodles. It gave the salad an added sweet crunch. 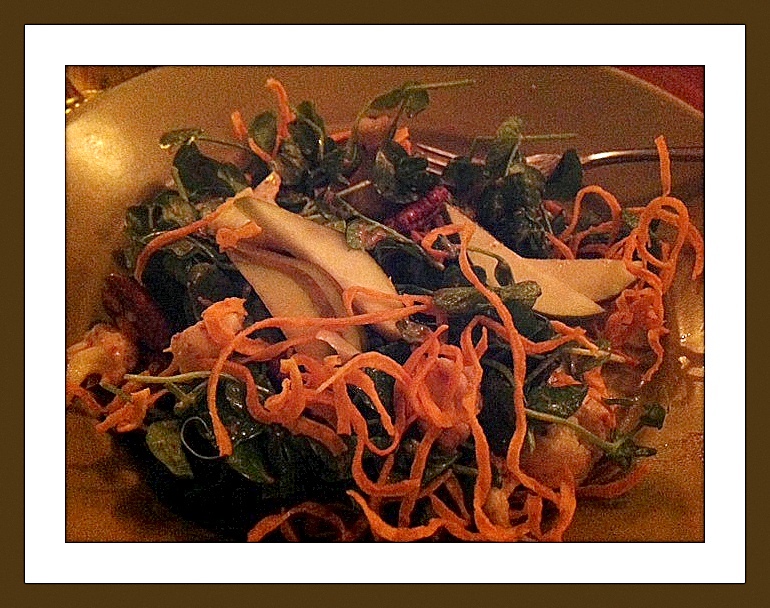 Brian’s “salad” was even more delish! 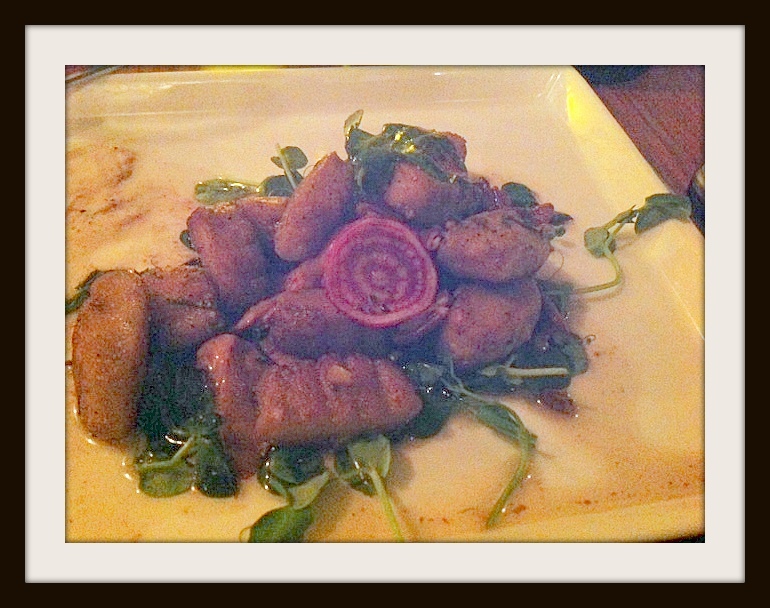 It had chantrelle mushrooms, sage brown butter, pecans, candied striped beets and goat cheese gnocchi. WOW! It was out of this world! I would have been happy just having another serving of that for dinner! I can’t describe how everything was cooked to perfection, a fried crunch on the outside of the gnocchi, the beets were firm, but not raw, and the brown butter… well how can you go wrong with that? The flavors mixed so well and Mmmm.. I can even smell and taste it now! Next we were brought chicken liver torchon which was spread on grilled baguettes with brown mustard and paw paw jelly. Mmm… Super fantastic. 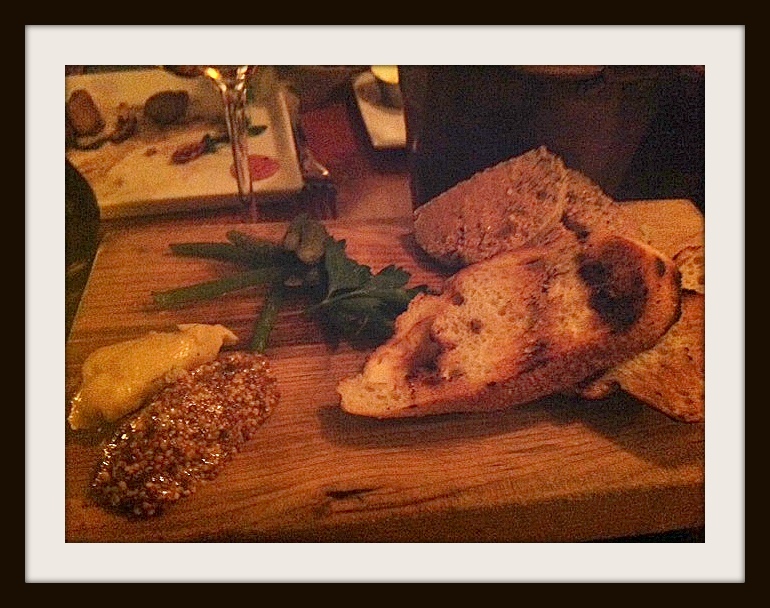 I’m not usually a fan of liver pate, but this was fantastic! 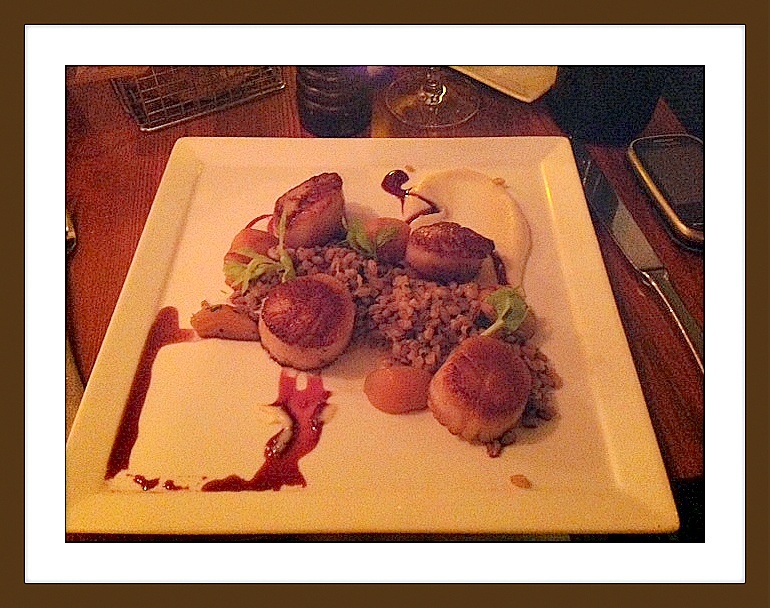 Brian then had pan roasted sea scallops with roasted farro, celery root puree, sweet and sour beets, with a red wine reduction sauce. Both of us really enjoyed this as well! 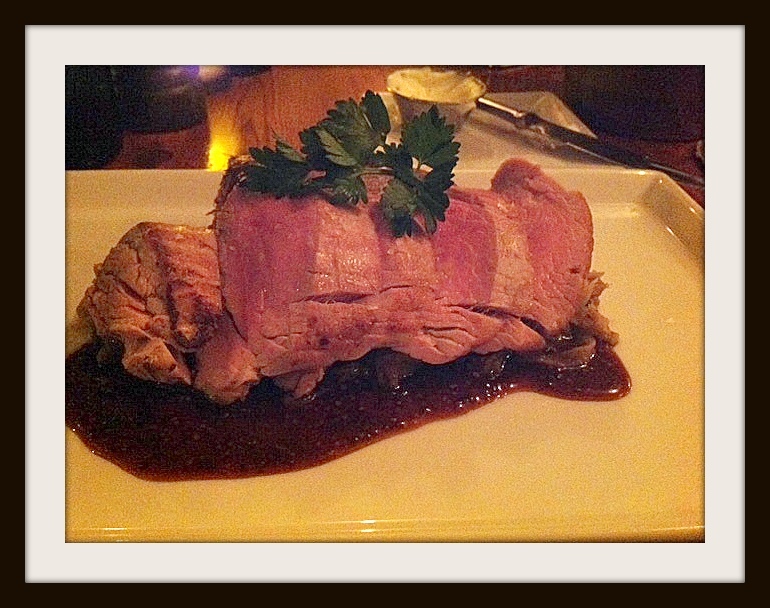 I had the roasted pork loin with virginia ham and sweet potato gratin with kohlrabi sauerkraut in a fernet reduction sauce. This too was really tasty! All of dinner was such a treat and the ambiance was spectacular and the service superb! 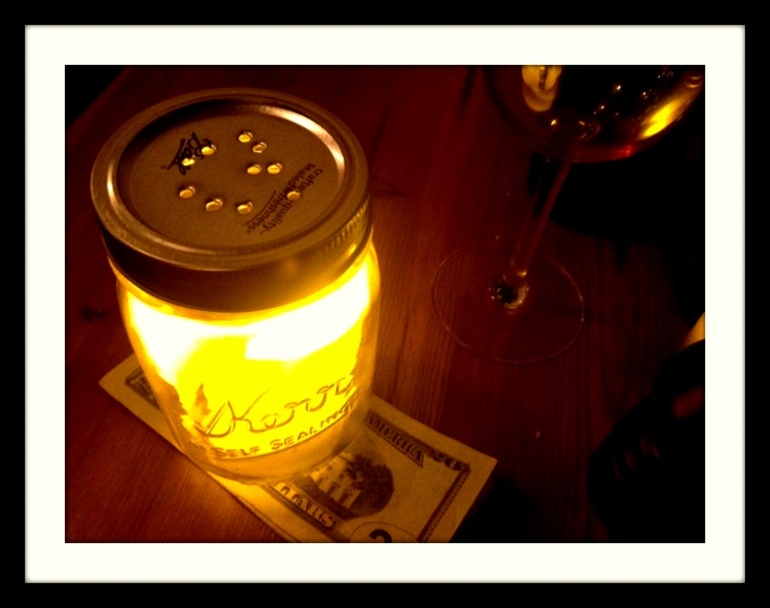 The check… remember the restaurant is ‘Firefly’! LOVED it! 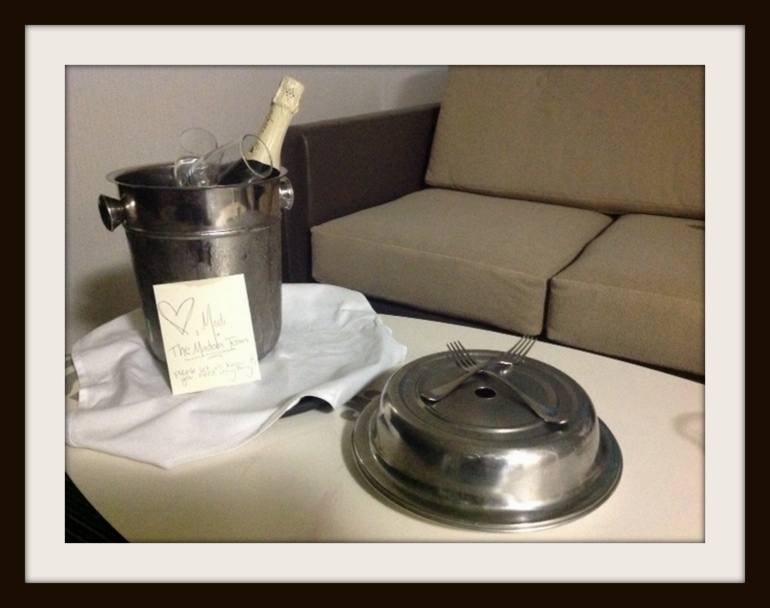 When we had enjoyed the last sips of our drinks and every last crumb off our plates we headed back to our room… only to find a bottle of chilled champagne with a slice of red velvet cake and two glasses of bourbon with a note from the manager and hotel staff! What a surprise and treat! We weren’t able to finish all of the champagne that night… but it wasn’t a problem! The ice bucket kept it chilled all night and in the morning we got some OJ from the minibar and had mimosas first thing in the morning! Once we got up and moving (it was nice not to be woken up by lots of little voices and patterning feed, although we did miss them!) we went into Georgetown for coffee and breakfast and to walk around. It was so nice and reminded us of our younger days when Brian worked in The District and we used to spend a lot of time there. In fact, we were even contemplating moving there at one point. During our meandering we talked about how different our lives would have been had we moved into DC. Later that morning we headed out to pick up our kiddos after much needed rest and a more than generous evening from friends! It was so enjoyable and I can’t recommend the hotel and restaurant enough. It costs a bit, but oh! so worth it! Once getting home and savoring the memories Brian and I realized that we hadn’t, in fact, gone too far off our paleo diets! There really wasn’t much bread or starches and those that were served could have been easily avoided. Also, we know the chef isn’t at all phased by special diets and allergies! I’m thinking my girlfriends (who have NUMEROUS food allergies) and I should have a girls night and visit the restaurant for an evening of fantastic food that they can enjoy with no worries! Hmmm… something to think about!! !… and save up for!!!! 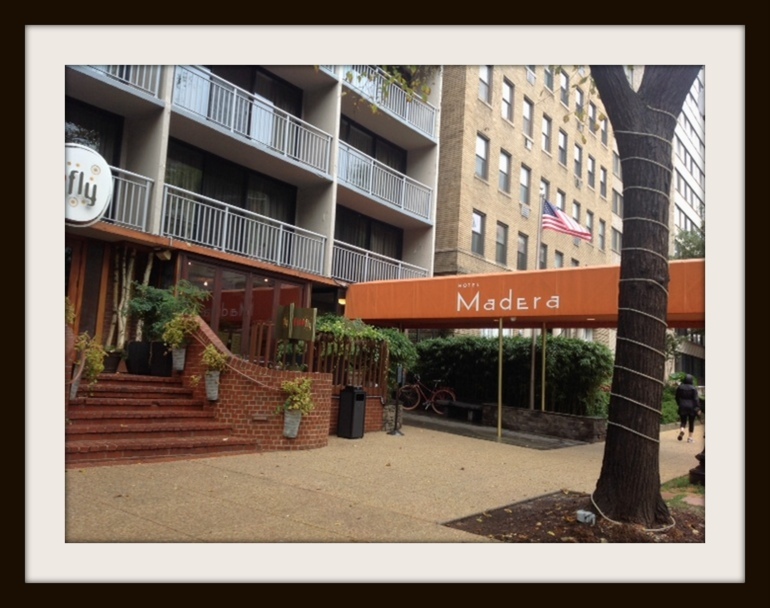 Have you stayed at Hotel Madera or eaten at Firefly? If so, I’d love to know what you think! You just gave me a wonderful idea for my birthday coming up! Hubby and I could have some time alone(which almost never happens) and celebrate too! Thanks! Both these places look wonderful!!! GREAT! If you end up going, I’d love to know what you think!